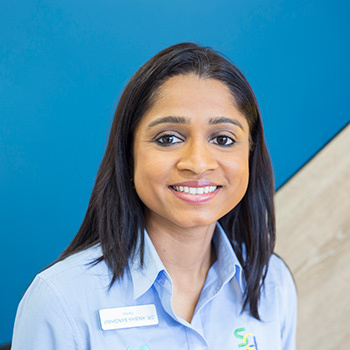 Since graduating from dental school, Dr Anisha has been passionate about providing high-quality dental care to her patients and giving them gorgeous, healthy smiles. She also is committed to helping her patients make an educated decision about their dental care. I always aim to look after the health of my patients, particularly in a dental chair where they can often feel nervous. Dr Anisha earned a Bachelor of Dental Surgery followed by a Master of Dental Surgery – Endodontics and Conservative Dentistry. She also took the Australian Dental Council Examinations. She was named Best Outgoing Student in Endodontics and Conservative dentistry in 2007. Dr Anisha is a member of the Australian Dental Association. Dr Anisha also has been published in the International Endodontic Journal in 2009. Outside the practice, Dr Anisha enjoys spending time with her husband Dr Mitesh and their two children. “Our two beautiful children are a blessing, and they keep me busy outside of the practice.” She also loves reading and travelling and is constantly seeking to learn new things. Experience comfortable dental care in a warm and caring environment. Contact us today to schedule an appointment with Dr Anisha.